Some days ago my friend from Greece, Zacharoula Gaitanaki, sent me a copy of the new book about ZONI, named 200 years Zoni (1810-2010). The author of the book is Zacharoula Gaitanaki herself, and it is a publication of the Educational and Local Improvement Society of Zoni, Arcadia (ELISZ). It is good to know that although Greece is currently traversing some very difficult times, people like Zacharoula and her friends from Zoni continue to be optimistic and contribute to uncover more of Greece's cultrual and historical heritage. The book is divided in different parts. 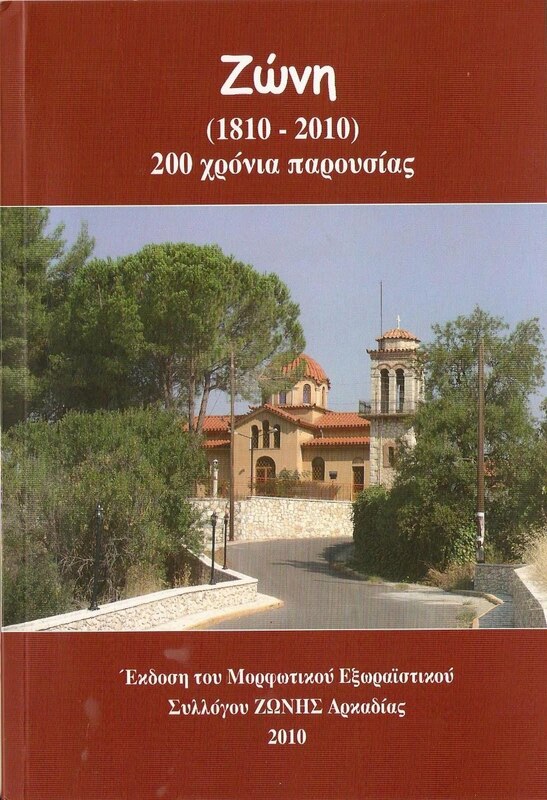 Mr. Athanasios P. Argyropoulos, President od the ELISZ, is the author of "Zoni, our beloved village". There is a message from the Mayor of Gortynos, Mr. Konstantinos Michopoulos, and a Preface named "Zoni of out heart" by Zacharoula Gaitanaki herself. Other sections discuss subjects such as Zoni, place, history, people; The church of Saint Demetrius and the small churches; Floklore of Zoni (place names, family names, nicknames, etc. ); and a poem by Zacharoula named "Zoni". Another chapter is "The Educational and Local Improvement Society of Zoni", by Mrs. Christina Bailou - Lampropoulou, Secretary General of the Society. Zacharoula Gaitanaki writes the following about the book: "200 years Zoni (1810-2010) isn't a sad memory of the beautiful past tenses of our village, but iti is a tender presentation, full of love and respect. Our village has a solid and unquestionable place in our hearts. Because Zoni, is Zoni of our heart..."
I am sure that it would be an excellent idea if the ELISZ publishes the same book in English in the near future. Non-Greek speaking tourists would surely find it handy, enlightening and interesting.